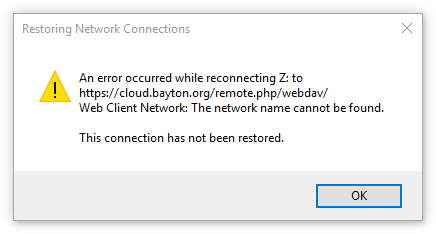 Recent updates to Windows 10 have been interfering with my mapped Nextcloud webDAV network folder. The WebClient service needs to be running and, preferably, set to Automatic. 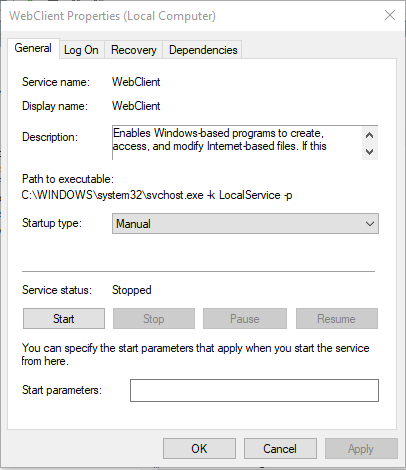 However I’ve noticed with Windows updates this service is infrequently being set to manual and therefore preventing access to new or existing webDAV connections. By settings Startup type to Automatic, the issue will no longer present itself. To avoid a reboot, in the above screenshot simply click Start to restore the connection immediately. Hi Jason, i dit all the tweaks you posted but after restarting Windows 10 it wasn’t automatically reconnected. i mapped Nextclouds webdav using an app-password and the following url: https://domain.tld/remote.php/dav/files/user/ successfully. That seems to be the root cause – thx! Which is listed in the settings icon on the bottom right of NC. I can’t make out much of that error, but can you validate the service is up and running properly? The NC service is up and running (as i described on my blog https://www.c-rieger.de/nextcloud-installation-guide/)…if i configure the url provided by NC-webinterface no connection could ever be established. But using the url i provided earlier it works as expected.